When I was in high school, I had this really annoying habit. I would meet someone new, and within 5 seconds of the conversation, I would immediately gasp and ask, "So, where are YOU from?" wide-eyed. I had to know. You see, as a child, I grew up in a predominately black neighborhood in Newark, NJ. My teachers looked like me. My classmates look like me. My neighbors looked like me. All that changed when my mom succeeded in getting me placed into a magnet school, Science High, to alleviate any disparity in my primary education and prepare me for college. Suddenly, my experience was changed. I took the bus 40 minutes downtown, closer to Newark's historic Ironbound section where my high school was. I had teachers who were white, classmates who were first-generation Americans with parents from Brazil, Poland, Bangladesh, and Honduras, to name a few. I saw goth fashion for the first time. I heard Portuguese in the hallways, and although I didn't care for the 1 hour commute each way, school was interesting. And I was curious. I wanted to see more, hear more, live more. I'm an adult now, so I don't stop and ask people where they're from (at least not right away, or not unless they ask me first because, let's face it, sometimes my headscarf can throw people :P). But the curiosity is still there. I still love to hear people's stories, to go beyond what my assumptions of who they appear to be at face value. And it's at a time like this, when we have so much healing to do, that I am reminded of the purpose of my art. Why I feel happy and excited on most days that I get to put my art into the world and into a stranger's home. It is because art allows us to reach out, stand up, and often times, stand with people who are different than we are. I get it. I understand that it's hard to reach outside of your comfort zone, to talk to people who look differently then you do or have different backgrounds. But with art, we have SOME common ground. It's a way in for our patrons and collectors. And for artists, it's a way out. It's how we choose to show up in the world. It's a way for me to show up fully in the world as a person, with no labels, not as my religion, not as my skin color, not as my sexual orientation, not as my gender, not even as my politics, but as a human being, having a human experience, if only for a moment. I can focus on the doing. Not the being, and sometimes that's easier. However hard it is for us to be different, or to be made to "feel" different, we can have the courage to make a difference, to make something, be it a statement or not. And it's the making, the doing, that gives us some release, and puts us in "the flow" as they say, right? After mourning and grieving (and to be honest, I'm still not done) for the past few days, last night I sat thinking. I couldn't shake this gnawing feeling in my chest. That feeling of "what else can I do?" like so many others. I'm not at any rallies. I'm not one of the protestors. I'm not one of the police officers on the front lines. I'm here. I didn't want to share my work anymore or even put my latest collection up for sale. I thought, maybe art has no value if it's just to make you "feel good", that it wasn't a time to put something beautiful out into the world anymore. That art itself didn't matter. I reached out to my community on Snapchat and various Facebook groups, a community which by the way, has been very vocal in the past 48 hours (Mark Zuckerberg himself even weighed in) in voicing their stance against the atrocities we've witness thus far. Even though many of them are not black. Even though it's uncomfortable. Even though it would be easy to keep going on with business as usual. And some of my artist friends have replied back with their thoughts, but there's very little answers. The thing is, everything we are supposed to do as artists we are already supposed to do as human beings. We mourn. We listen. We help our neighbor. We practice self-care. We communicate beauty. We be the light. But we do not sit quiet. We say something, at the very least. We do something. We make something. And hopefully we can make a difference. I want to end this post with the wise words of an artist I admire, Jeanne Bessette, who told me today that "Art is enough." It put my heart and mind at ease and so I share it here with you. Thank you all for teaching me some lessons today and this week. I've learned the power of standing up for causes I believe in, even if I'm not directly affected. I've learned what it means to be an ally. And I hope to be of service to others in the way many have been on this topic this week. It's been a rough few days and we've got a long way to go. But I needed to acknowledge my creative community. Thank you for showing up wherever you are. Showing up on the hard stuff. Today, be a little awkward. Ask an annoying question. Have a hard conversation with someone in your circle. Step outside of your comfort zone and if you're learning in the process, you're doing more than most. 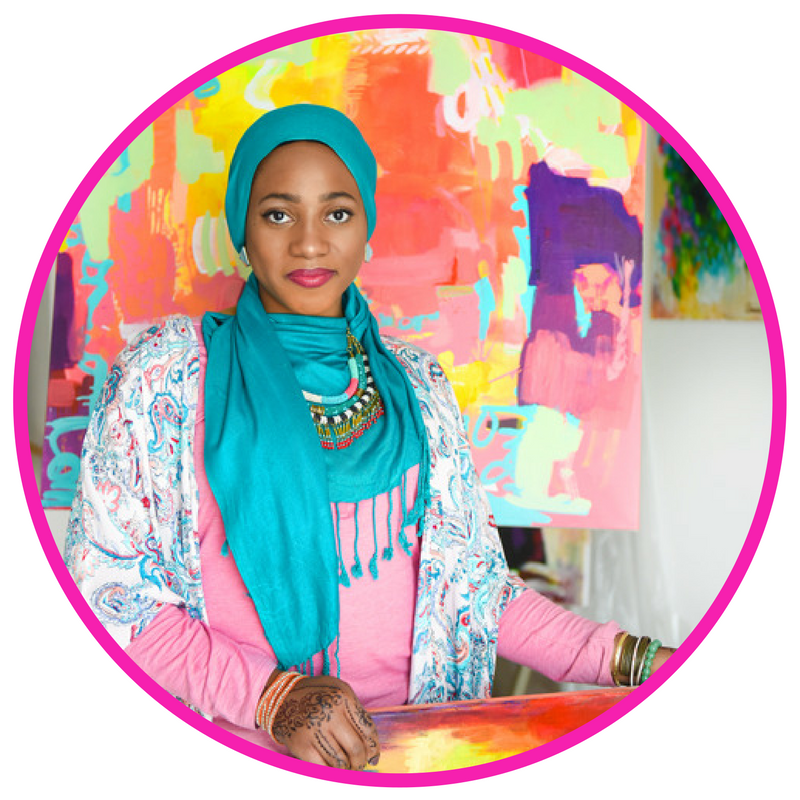 AMIRA RAHIM - A PASSIONATE ABSTRACT ARTIST ON A MISSION TO MAKE THE WORLD A MORE COLORFUL PLACE. "Painting is my way of honoring my time on earth. Itâ€™s my way of paying homage to the human experience. And itâ€™s a process that moves me every day." Older PostThe (real) effect of asking "How Was Your Day?" By submitting your name above, youâ€™re agreeing to be signed up for weekly emails, promotions and more from Cyndie Spiegel Inc.